Summertime is just around the corner! 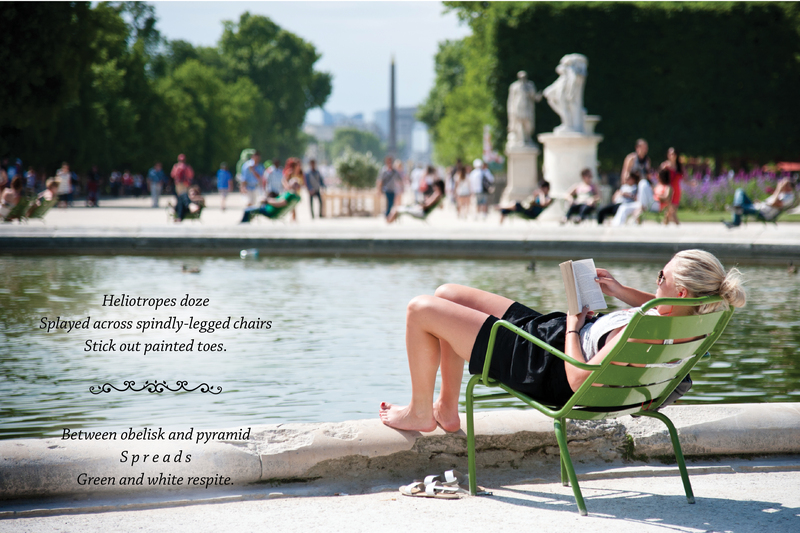 Time to catch some rays … Parisian style. Parisians enjoy their city gardens and parks year-round, but especially in late spring and early summer. Sunbathing and napping in the gardens and parks is seen as healthy and stress-reducing. Two little details catch my attention almost every time I stroll through these green havens. The first: In two of the larger gardens, the Luxembourg and the Tuileries, there are sturdy steel chairs painted green to sit in. Although quite heavy (in spite of their thin-looking legs), most folks will drag a chair to a choice spot and then often drag a second one over to the first to use as a footrest. Then comes the precise orientation of the chairs to receive the most benefit from the sun. As the day wears on, subsequent sunbathers will re-position the chairs to align with the sun as though they were human sunflowers. The second: Rather than paving over every inch with asphalt, Parisians seem to prefer leaving the garden paths and other ground surfaces bare or a bit rustic, with just a thin layer of chalky gravel over the dirt. And, while I do respect this idea, it causes me much consternation when I exit the garden and notice my shoes. Covered with tenacious chalky dust from the gravel, my black shoes are now dusty gray and will require brushing and rinsing to recover. Don’t sport your new Jimmy Choo’s in Paris gardens! I was initially inspired to write this: “Heliotropes doze / Splayed across spindly-legged chairs / Stick out dusty shoes.” But when I gave my photographer this assignment in August, there were only bare feet propped up on those green footrests! How clever I felt when I devised a more appropriate five-syllable ending! In a second haiku, I play with the form and tweak the syllable count–experiments very common among haiku poets today, writing in languages other than Japanese. We finally got some much needed rain this weekend (it always seems to come on a weekend!). The snails are happy. The photographers were out hunting rainbows. The pattering sound on my roof was comforting. 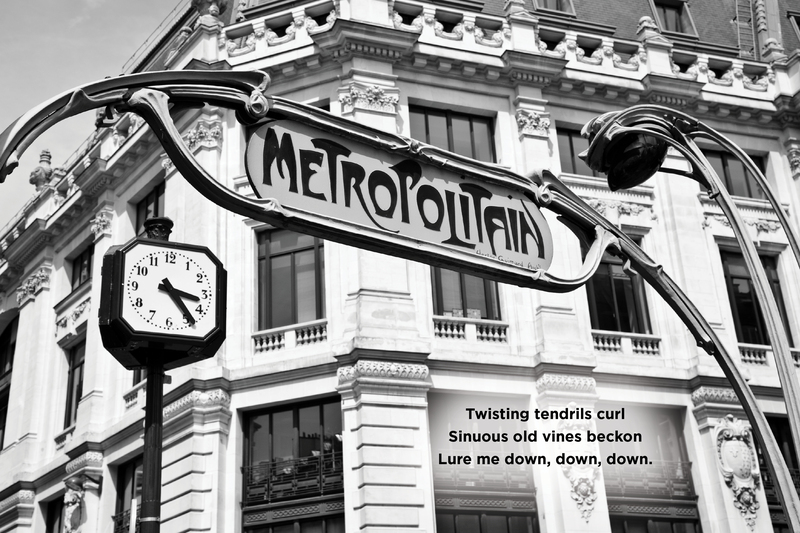 I have only one haiku so far that mentions rain in Paris (but it’s not about singing in it), so I thought I’d post that one this week. 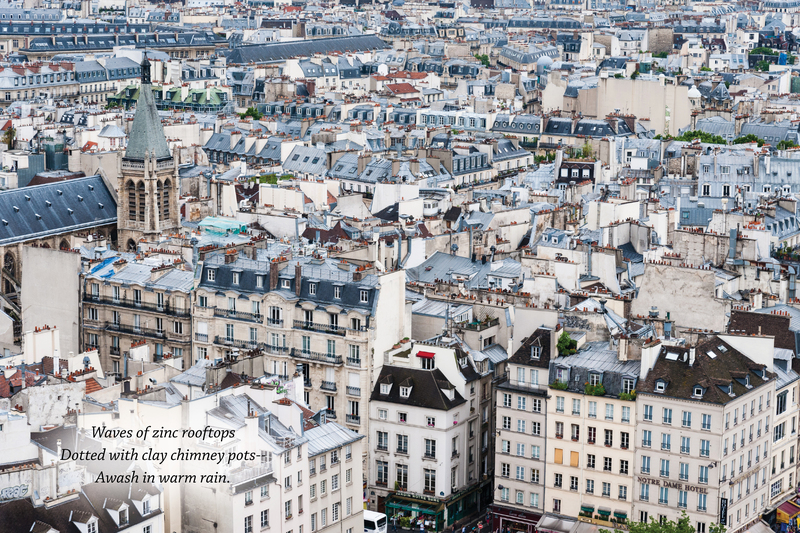 The sheets of gray zinc used on the roofs of so many Paris buildings gives almost any view over the city’s rooftops a uniform and rhythmic quality. Add in the rows of clay chimney pots and topmost windows (often with flower boxes full of bright geraniums overflowing the railings), the ubiquitous shutters and cream-colored building façades–and you have another “icon” of Paris: its rooftops. The patterned effect is charming. They look even better when wet! My 17-syllable impression is below. I encourage you to give yours!